Equipped with 2000mAh big-capacity lithium battery,flash firing times is over 750. 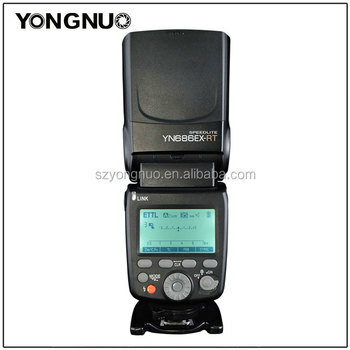 In shooting with 2.4G radio transmission wireless flash,one YN686EX-RT can be used as master unit to trigger YONGNUO and Canon’s RT series speedlite,and remotely control the flash mode and output level of the slave speedlite;One YN686EX-RT can be used as the slave unit,to receive the radio trigger signal from the RT series speedlite and flash trigger of YONGNUO and Canon,to achieve off-camera TTL,M,Multi functions and Gr grouping flash. GN60@ISO100,200mm,supports TTL, M, MULTI and Gr flash, the maximum sync shutter speed is up to 1/8000s.